YoYoFactory - Play like a YoYoFactory Legend! While they are having a blast pushing the boundaries of what the modern yo-yo is capable of, YoYoFactory wanted to pay homage to where the modern yo-yo started out. We introduce the Legend! YoYoFactory spent some serious time designing the prefect one piece wooden yo-yo that could perform as good as the "classic wooden yo-yo" your grandpa played with. A few custom laser-engraved collaboration yo-yos were released while they spent time deciding on the paint and readying this official release of the LEGEND! 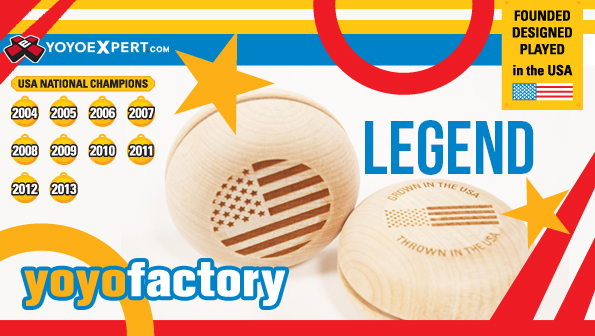 The YoYoFactory Legend is a full painted one-piece wooden yo-yo, branded with an embossed foil sticker just like the classics! Such a beautiful look. Play like a YoYoFactory Legend and challenge yourself to throw like they used to back in the days of fixed axle!